"The information revolution provides an invaluable new set of tools for all partners striving to achieve sustainable development. It makes empowerment both meaningful and effective and opens up for developing countries the prospect of leapfrogging over earlier communication technologies to become real participants in the global economy." Maurice F. Strong, former Secretary-General, the Rio Earth Summit (1992). This paper discusses the uses of Information and Communication Technology (ICT), the dimensions of access and the digital divide, and the development of telecentres in the Sub-Saharan African region. It illustrates that the development initiatives perceived technical access to computers and other ICT as the only prerequisite to economic and social development when in actual fact extremely important social access to literacy, content, housing and health is not given much consideration in the development agenda. Finally, it discusses experiences at one of the telecentres, the Nakaseke Multipurpose Telecentre in Uganda, by drawing on data from the evaluative report of the International Development Research Centre (IDRC)-sponsored telecentres in Africa. Keywords: Access, ICT, digital divide, telecentres, development challenges, sub-Saharan African region. The Regional African Satellite Communications Organisation (RASCOM) project that aims to provide satellite communication, and effective linkage between Sub-Saharan Africa telecommunication networks with those of the other continents. To speed up the region's integration to the global information exchange system, governments of many Sub-Saharan African countries are also introducing institutional reforms such as "divestitures of public enterprises and commercialization, liberalization and privatization" of the countries' telecommunication industry" (M'bayo, 1997:351). However, with the free flow of information, privatization and liberalization doctrine at the heart of the �new' development paradigm, concerns surrounding equity issues such as access, ownership and allocation of resources are becoming important. It is within this context of globalization 2 and the continued marginalization of Sub-Saharan Africa that this paper will discuss the uses of ICT, the dimensions of access and the digital divide and the development of telecentres in Sub-Saharan African region. Finally, it will discuss experiences at one of the telecentres, the Nakaseke Multipurpose Telecentre in Uganda, by drawing on data from the evaluative report of the IDRC-sponsored telecentres in Africa. Using ICT for community development. For instance, the Internet could be used in developing "locally appropriate applications and services; �enable efficient regional, national and global organization efforts; � and enable rural young people to learn about computers and to have access to technologies and information available to their urban peers" (Richardson, 1998:174 as cited in Melkote & Steeves, 2001). Accessing market information and prices on locally produced goods or farm products. For instance, Sub-Saharan African farmers and even government owned agricultural institutes might be able "to get real-time access to market data, information on standards and rules, prices and potential customers" (World Bank 2000:9 as cited in Polikanov & Abramova, 2003) for their products at both regional and global markets. Stabilizing the financial markets and banking systems. With advanced technologies, cash and financial transactions could be processed faster and more securely. In addition, instead of time-consuming paper based book-keeping methods and manual approaches of counting money, computers and accounting software could be used to speed up transactions. For instance, Mauritius introduced electronic payment systems to modernize its service sector. Nigeria, and Cote d'Ivoire and some other Sub-Saharan African countries developed satellite information networks and computerized trade complexes in order to update information on their stock and commodity exchanges (Polikanov & Abramova, 2003). Using ICT for educational purposes. Students and lecturers could access a variety of academic journals and papers via the Internet as well as through electronic databases. Also, multimedia materials could also be used for teaching purposes. From the critics' standpoint, all these potential benefits are attainable if ICT is considered as a means (not as the end). That is, we need to be able to separate ICT from the information that they produce "and examine peoples' capacities to receive, process, use, and transmit information" (Melkote & Steeves, 2001:263). Having technologies is one thing, but whether or not people can use them effectively is another thing entirely. If ICT is in place and people are unable to use it for their collective good due to constraints such as an absence of expertise and infrastructures to support the application of the technologies, these technologies are apparently useless. In other words, " mere exposure to a technology does not guarantee usage, and, as such, the existence of information in society does not assure the use and concomitant acquisition of knowledge" (Oyelaran-Oyeyinka & Adeya, 2004: 68). ICT will support the learning and acquisition of knowledge processes, but not replace the learning and acquisition of knowledge (Mansell & Wehn, 1998; Alhassan, 2004). This means "a learning process must precede the application of ICTs" (Patterson & Wilson, 2000 cited in Alhassan 2004:100). Therefore, in order to make ICT applicable and useful to the people, it is important that we extend access to ICT beyond the technical level - provision of new infrastructure or access points (such as telecentres). As will be discussed later in this paper in an analysis of the experiences at the Nakaseke Multipurpose Telecentre in Uganda, providing technical access (such as telecentres) does not necessarily facilitate effective uses of ICT for social and economic benefits. S ocial factors such as literacy levels and poverty are important in the use of ICT, and should be given important consideration in the planning and designing of ICT initiatives. As Michael Gurstein (2003) has explained, access to either infrastructure or computer terminals is not the most significant thing. "Rather what is significant is having access and then with that access having the knowledge, skills, and supportive organizational and social structures to make effective use of that access and that e-technology to enable social and community objectives" (10). For instance, it is self-evident that an illiterate person who does not have "the usage skills and knowledge of English or the language in which the Internet messages are encoded" will not be able to access information on the Internet even if he/she has Internet access (Melkote & Steeves, 2001:264) . Likewise, an individual who can barely afford two meals per day might not have money to buy or access ICT (Heeks, 1999). These social factors as well as other institutional structures, such as political regimes and economic systems, contribute to the social exclusion of a significant number of people, especially in Africa, from access to ICT and the uses of ICT. And as Alhassan (2004) suggests, these social factors should not be ignored when we talk about the digital divide. The digital divide is a term that is often used in describing "disparities in access to, and usage of, the telephone, personal computers and the Internet across demographic groups, within the same country, or between countries" (Sonaike, 2004:42). The International Telecommunications Union (ITU) defined the digital divide as "the division between countries and people within countries who have real access to ICT and are using it effectively, and those who don't" (as cited in Gurstein, 2003). Of course, t he continent of Africa provides ample evidence of the digital divide within the same country and between countries. It is not unheard of that in most African countries significant numbers of people living outside the capital cities or metropolitan cities have not made a phone call in their entire lives (UNDP, 2001). It is more than 50 times likely that people in the rural areas will be without a telephone, let alone an access to the Internet that can be prohibitively expensive. It costs at least $65 per month for Internet access in most parts of Africa, and this cost of Internet access "could exceed $100 per month when the cost of telephone calls is added" (Panos 1998 cited in Melkote & Steeves, 2001). As of 2000, 38 of 54 countries in Africa have less than 250,000 fixed telephone lines. Only Algeria, Egypt, Morocco and South Africa have more than one million fixed lines. For instance, "in East Africa in 2000, where 49 percent of the population was below the poverty line established by the United Nations, there was one telephone line for every 1,000 persons" (Franda, 2002:12). In fact, there are some cities within countries in Africa where telephones and other forms of ICT are "simply non existent let alone making it work for human development" (Sonaike, 2004:51). It is obvious that Africa has poor Internet connectivity and it is at the periphery of ICT development. But the digital divide, as it is currently conceptualized in most discourses on ICT for development, has trivialized global imbalances in access to ICT. It has limited the global imbalance in the access to ICT, which I contend should be seen within the overall context of socio-economic imbalances, to technical access (that is physical access to computers, Internet connectivity, and telecommunication infrastructure and services). As Henry Jenkins put it: " The rhetoric of the digital divide holds open this division between civilized tool-users and uncivilized nonusers. As well meaning as it is as a policy initiative, it can be marginalizing and patronizing in its own terms" (cited in Warschauer, 2002). As a result of these flaws in the conceptualization of the digital divide, social dimensions such as access to education and content are often ignored or given less attention in most ICT initiatives that are aimed to bridge the digital divide. Hence, the complex problem of access to ICT is simplified and thus the provision of computers and access points such as telecentres are prescribed as solutions. The digital divide is more than just technical access. It should also include social access, which includes literacy. Before the arrival of digital technologies, there have been various forms of �divides' such as literacy (Alhassan, 2004). In addition to the digital divide, these earlier �divides' still exist in one way or the other in our various geopolitical locations. This is why it is so important to emphasize that global imbalances in access to ICT should be viewed within the overall context of global socio-economic imbalances. Thus, to address the problem of imbalance in access to ICT, Mansell (2001) and Shade (2003) suggest adopting a social capabilities approach. "These capabilities include general education and technical competencies, the institutions that influence abilities to finance and operate modern organizations, and the political and social factors that influence risks, incentives, and personal rewards including social esteem" (Mansell, 2001:56). To build international momentum and buy-in [in] order to continue expansion of access to ICT by rural and disadvantaged groups. (http://www.idrc.ca/acacia/ev-6091-201-1-DO_TOPIC.html ). To learn from Acacia's community-based research and experimentation and to widely disseminate this knowledge. (http://www.idrc.ca/acacia/ev-5898-201-1-DO_TOPIC.html ). The first phase from 1997 to 2000 focused exclusively on four countries: Mozambique, Senegal, South Africa and Uganda. Some of the IDRC initiated projects in Phase One included the establishment of community telecentres, school networking activities, and the forum for ICT policy development initiatives. For the purpose of this paper, attention will be paid only to the telecentre projects because they have been hailed by the World Bank, some non-governmental organizations (NGOs) and developmental agencies such as IDRC as having a considerable potential for narrowing the "digital divide" in remote, rural and otherwise disadvantaged communities" (Oestmann & Dymond, 2001:1). Hence, the rest of this paper will be devoted to analysis of the telecentre experience in one of the IDRC established telecentres in Africa, the Nakaseke Multipurpose and Community and Telecentre. The Nakaseke Multipurpose Community Telecentre, which is located in Uganda in East Africa, was chosen because it is "reputed to be the first such facility in Africa" (Etta & Parvyn-Wamahiu, 2002: 71) and it is located in a rural area. Being a pilot project, it ought to serve as a model for subsequent ones to follow. That being said, the IDRC designed Nakaseke Multipurpose Community Telecentre was conceived with the intention to be differentiated from the private-run cybercafes that have dotted virtually every major city in Africa. The data that is used in the analysis is primarily taken from IDRC's evaluative report of its telecentre initiative in the Sub-Saharan African region. Before proceeding with the experience at the Nakaseke Multipurpose Community Telecentre, a brief introduction about telecentres and their common varieties in Africa will be provided. Telecentres are usually "strategically located facilities" for public access to ICT-based services and applications (Oestmann & Dymond, 2001). Telecentres come in different sizes and offer various services depending on the location and availability of resources. Jensen & Esterhuysen (2001) classified various types of telecentres that are popularly found in Africa into four groups: micro-telecentres, mini-telecentres, basic telecentres and multi-purpose community telecentres. The first three- micro, mini and basic telecentres-are primarily an extension or an offshoot of the public call offices (PCOs), which normally provide payphone services, fax and photocopying services. The only major difference between these telecentres and the PCOs is that telecentres have computers that are connected to the Internet for the e-mail and web-browsing purposes. Micro-telecentres are usually built-in public payphones with Internet access and possibly smart-card readers or compartments for coin and bill operation. They are often found in public spaces such as airports and train stations (Jensen, 2001). 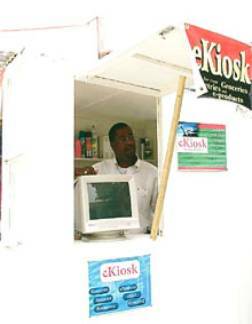 Sometimes, a micro-telecentre can also be found in a small kiosk with a computer with an Internet access. The owner of this kiosk usually sells calling-cards and air-time for mobile phones. 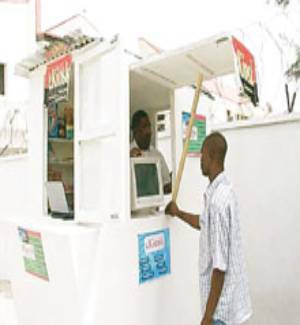 Figure 1 shows a micro-telecentre in a small kiosk in Lagos, Nigeria. Mini-telecentres offer a single phone line, calling cards, printer, a computer with Internet access and sometimes a fax machine. Basic telecentres offer all the services of the first two, but with multiple access points (Alhassan, 2004:193). Multi-Purpose Community Telecentres, on other hand, are the most advanced telecentres and often promoted by the International Telecommunication Union (ITU) and development agencies such as IDRC. Multi-Purpose Community Telecentres provide all the services that are available in the first three telecentres as well as providing information technology training and videoconferencing. In particular, they "function as community information centres, providing access to databases and receiving and posting information of general interest to local people (e.g., government notices, information on the spread of diseases, weather information, prices of farm products, educational opportunities)" (Oestmann & Dymond, 2001:4). Source: Punch Newspaper, March 27, 2004. Given that African communities have thrived on shared access practices in previous technological usages 4, the communalization of ICT access and usage in the form of telecentres is not a new phenomenon for most African communities and cities. In fact, having a communal telecentre, which houses technological facilities such as fax machines, photocopiers, telephones and computers, " helps to split costs among the large number of users, thus diminishing individual expenditures" (Polikanov & Abramova, 2003:46). In most African countries, it will cost billions of dollars to install basic infrastructures for the functionality of telephone, Internet and electricity in each house in every locality. As an example, for Nigeria to have one telephone line per 100 people, it would cost the country about $2-3 billion USD according to the World Bank (World Bank, 1997). Nigeria, which is one of the most populous countries in the world, has a population of over 120 million. Nigeria is not the only country in Africa with such a daunting challenge to achieve connectivity for the vast majority of its population. It is virtually all the African countries that are facing this uphill task. However, since governments have to decide on whether to spend billions of dollars on technological infrastructures or on the more important social programmes such as health care and education, communalization of ICT access and usage in the form of telecentres could be a short-term approach to facilitate people's accessibility to ICT, especially those in the rural environs. IDRC's Acacia programme particularly targeted people in the rural areas. The model of telecentres envisioned in this context is a synchronized version of the various models that have been adopted in Scandinavian countries, Australia, North America and Western European countries, especially Britain and France. For instance, in Scandinavian countries, telecentres were established to stop the massive migration of people from rural areas to urban areas as well as to build local IT expertise. In some other European countries and in the US, telecentres are designed for creating new job-opportunities and supporting workforce. "In the UK and in France most centres function as telework centres providing facilities for teleworkers. This concept is also widely used in North America" (Falch, 2004:103). These telecentres are meant to enhance community development as well as to develop local expertise. modeled on western projects to bridge the digital divide between haves and have-nots. The African Information Society Initiative of the UN Economic Commission on Africa touts the community telecentres as an alternative to the western infrastructure model of wiring every family home. The telecentres provide telephone, fax, email and Internet access as well as training to use them. The goal is to promote economic development, but also for political growth, social communication and education (Robins, 2002:238). Between 1997 and 2000, IDRC's Acacia programme established a total number of 35 telecentres in Benin, Tanzania, Mali, Uganda, Mozambique, Senegal and South Africa . With the exception of five that were jointly funded with UNESCO and the ITU, the rest were funded by the IDRC in partnership with businesses such as Nortel Networks, Canada's telecommunication giant (Robins, 2002). IDRC and its partners created telecentres in belief that they would bring ICT closer to people in the rural and urban cities of these selected African countries. It is imperative to note that there were also hundreds of telecentres set-up by private local entrepreneurs and local elites in these countries for commercial purposes. In South Africa, however, the government initiated telecentres, and by the end of 2000, the South African government had set up 65 telecentres in the marginalized rural communities in nine provinces (Benjamin, 2001; Alhassan, 2004). These government initiated telecentres are part of the country's 1996 Telecommunication Act whose objectives are "to promote the goals of universal access to ICT" (Alhassan, 2004:194). At the time the Nakaseke MCT became operational in March 1999, there was only one fixed telephone line in the area. In 2001, alongside with the telecentre, there were about 250 fixed lines and two public payphones in Nakaseke. In spite of this significant improvement, the telecommunication infrastructure in both Nakaseke and Kasangombe are still relatively low. Seventy-three percent of about 90,000 fixed telephone lines in Uganda are located in the nation's capital, Kampala. On the average, users in the rural areas have to travel about 24 km to reach the nearest telephone (Uganda Bureau of Statistics, 2001 as cited in Etta & Parvyn-Wamahiu, 2002). Since its independence from Britain in 1962, Uganda has been through economic turmoil, political instability and civil unrest including guerrilla war. Postcolonial Uganda has been described as a story of "unfilled promises" (Mutiibwa, 1992 as cited in Mwesige, 2004). While about 35 percent of the country's approximately 28 million population lives below the poverty level, there are estimated 125,000 internet users in the country. Only 2,692 internet hosts are available to all these 125,000 users. However, the country has more mobile telephone users. Based on figures gathered in 2003, there are 776, 200 mobile users in Uganda. This is more than 10 times the fixed telephone line subscribers. In 2003, there are 61,000 fixed telephone line subscribers in the country. Table 1 provides more statistical data on Uganda's infrastructure, economy and population. IDRC alongside with its partners - the ITU, the UNESCO and the Ugandan government -­put down 60 percent of the operating costs for the Nakaseke Multipurpose Community Telecentre. In total, IDRC and its international partners budgeted $396,425 USD for this project. Its national and local partners were committed to invest "about US$124,000 over the three years of the project, including about US$68,000 from Uganda Telecom for the telecommunications infrastructure" (Mayanja, 2001:111). The remaining 40 percent came from the local community, which also provided the building and security guards for the telecentre. This building is valued at $25,000 USD. The building maintenance as well as the salaries of the telecentre's staff are also taken care of by the community (Mayanja, 2001). Operating in an office space of about 178 metre square (m 2 ), Nakaseke MCT has four staff and a management committee primarily made up of the high-ranking representatives of the stakeholders in the project. The stakeholders are UNESCO, IDRC and the Uganda Telecom Limited (UTL). The management committee is responsible for the management and policy matters of the telecentre. There is also a local steering committee, which is made up of the Uganda based representatives of UNESCO, IDRC and the UTL. The responsibility of the local steering committee is not defined. A core-user group, which is made up of the users of the telecentre, is also set up to get feedback from the users on the services at the telecentre. Table 2 shows available equipment in the Nakaseke MCT. The Nakaseke MCT offers library services, IT skills training, typesetting, word processing, video services, telephone services, faxing, photocopying, telemedicine services and Internet access for e-mail and web browsing. On the first visit, some personal information is gathered on the users before they are given registration numbers and cards, which are to be used in the subsequent visits. This information, which includes users' name, address, age, gender and occupation are stored in the database. The stored information is later used in evaluating the services offered at the telecentre, customizing services to the users' needs and for decision making purpose (Mayanja, 2001). Privacy protection measures are rarely in place at the telecentre. While democratizing access to ICT and communalizing ICT through MCT might help in creating an information society in Africa, the statistical breakdown of gender, age and occupation of user groups of the Nakaseke MCT raises some concerns about the kind of information society that might be created. It is observed that over 65 percent of the telecentres are students. Also, 74 percent of the telecentre's users are male. Over 80 percent of the users are less than 35 years old. Table 3 provides a statistical breakdown of the gender and age of users from 1999 to 2001. With over 70 percent of the users being male and over 50 percent of the users being between the age group of 15 and 20, it is still evident there are significant inequalities in information access and usage of ICT in this telecentre along social categories such as age, gender and occupation (Sonaike, 2004). These inequalities do have negative implications on the telecentre as a �development' project because it is reproducing societal inequalities in terms of age, gender and socio-economic. Rather than closing the digital gap, the experiences at these telecentres show that they are actually consolidating the problem they ought to solve. The familiar and still formidable constraints are again rearing their ugly heads - poverty and illiteracy, lack of time, insufficient skills - with male-dominated, corporate control of the technology added to the list. This is the boy's party of the century, girls, and we are not invited (2000:32 as cited in Robins, 2002). the largest number of Africa's 1.5 million Internet users were young (25-35 was the majority age), were predominantly male, were well-educated (e.g., 87 percent in Zambia and 98 percent in Ethiopia had university degrees), had above-average income , were English-speaking, and belonged to nongovernmental organizations, news media, private companies (especially IT and computer businesses), and universities (Franda, 2002:18). Likewise, the result of the ECA's survey and findings at the Nakaseke are consistent with the findings at other IDRC's sponsored telecentres and private-run cyber cafés. According to the evaluation report authored by Etta & Parvyn-Wamahiu for IDRC in 2002, fewer women use telecentre services in practically all of the countries and facilities. The report indicated that, in Mali, 77 percent of the users are men. In Mozambique, 63 percent of the users are men and 70 percent of the users in Senegal are men. Another worrisome thing about data from Nakaseke and other telecentres is that the main activity of users is primarily e-mail - both ­sending and receiving e-mail from relatives and friends abroad. It is also to maintain ties with diasporic communities. Sometimes, the e-mail activity is also to apply for university admission in the US and other Western nations (Franda, 2002). Only a handful of the users actually use the telecentre resources for business or commercial purposes. "Between 1.0 and 20.0% of users visited the TCs (telecentres) for business or commercial reasons. Over 50% visited the TCs for entertainment" (Etta & Parvyn-Wamahiu, 2002:84) . The findings in this IDRC report show that the telecentres and ICT are used primarily for "social activities 6 than development-oriented action" (Etta & Parvyn-Wamahiu , 2002:84). These activities are being performed at the expense of other ICT-based services and activities such as e-commerce (such as African entrepreneurial activities online) and academic research. If the ICT activities primarily comprise e-mail activity and online chatting, then can telecentres narrow the digital divide and empower communities, socially and economically? What is then going to happen to the multipurpose community telecentre if the majority of the users are only engaged in e-mail activities and clerical work? There are no tentative answers to these questions at present. But, nonetheless, these questions do reflect the skepticism around ICT for development in Africa, and practically indicate some of the challenges for Africa in getting �connected'. Furthermore, the demographic figures from all these telecentres question the assumption that public Internet access is in ��the realm of the educationally and economically disadvantaged'' (Lee, 1999 as cited in Mwesige, 2004:98). And if care is not taken, the optimism of the World Bank and the IDRC that telecentres (and ICT in general) might narrow "the digital divide may appear far fetched" (Sonaike, 2004:44). From what was seen at the Nasakeke, the telecentres, which are meant to close the inequality gap, are also legitimatizing the inequalities in the status quo in terms of age, gender, educational qualification and socio-economic status. While it is true that telecentres have increased access to ICT in the region, the �development divide' between the region and the industrialized countries has not changed. However, this does not necessarily mean that all hope is lost. There is hope for the uses of ICT for development in Africa if there is change in the approach models for ICT initiatives in the region. Instead of paying more attention to the technical access, the focus shall be on the development of people's capability and skills for social changes. Secondly, as showed in this paper, the applicability of the Western-model of development programmes and technology transfer without adequate consideration of the cultural needs and local socio-political institutions of the developing countries will not yield positive results. For the collective good of the Sub-Saharan African region, it will be better "to turn away from the dominant path and take off the Western ideological straitjacket" (Nulens & Audenhove, 1999: 469). Alhassan, A. (2004). Development Communication Policy and Economic Fundamentalism in Ghana . Tampere: Tampere University Press. Benjamin, P. (2001). "Telecenters in South Africa" Journal of Development Communication, 12 (2): 32-38. CIA. (2005). The World Factbook . Available: http://www.cia.gov/cia/publications/factbook/geos/ug.html (Last accessed on October 22, 2005). Falch, M. (2004). "Telecentres in Ghana" Telematics and Informatics 21:103-114. Franda, M. (2002). Launching into Cyberspace: Internet Development and Politics in Five World Regions. Boulder, Colorado: Lynne Rienner. Gurstein, M. (2003). "A Community Informatics Strategy beyond the Digital divide." First Monday, 8 (12).Available at: http://firstmonday.org/issues/issue8_12/gurstein/index.html (Last accessed on July 27, 2004). Heeks, R. (1999). "Information and Communication Technologies, Poverty and Development." Development Informatics. Working Paper Series, Number 5.Manchester, UK: Institute for Development Policy and Management. Available: http://unpan1.un.org/intradoc/groups/public/documents/NISPAcee/UNPAN015539.pdf (Last accessed on October 22, 2005). Hudson, H.E. (2001). "The Acacia Programme: Developing Evaluation and Learning Systems for African Telecentres" in Colin Latchem & David Walker (eds) Telecentres: Case studies and key issues (159 -168). Vancouver: The Commonwealth of Learning. IDRC. (2004). "Acacia Initiative". Available: http://www.idrc.ca/acacia or http://web.idrc.ca/en/ev-5895-201-1-DO_TOPIC.html (Last accessed October 22, 2005). Jensen, M. & Esterhuysen, A. (2001). Community Telecentre Cookbook for Africa. Paris: UNESCO. Jensen. M. (2001). " Information Technology and Infrastructure for Telecentres: Combining Best Practice with New Developments" The Journal of Development Communication (12) 2. Available at: ip.cals.cornell.edu/commdev/documents/jdc-jensen.doc (Last accessed October 20, 2005). Lee, S. (1999). "Private uses in public spaces: A study of an internet cafe." New Media and Society 1 (3): 331- 350. Mansell, R., & Wehn, U. (eds.) (1998). Knowledge societies: Information technology for sustainable development. New York: Oxford University Press. Mansell, R. (2001). "The Deep Structure of Knowledge Societies." In Liss Jeffrey (ed) Vital Links for a Knowledge Culture: Public Access to New Information and Communication Technologies . (55-73). Strasbourg: Council of Europe Publishing. Mayanja, M.(2001). "The Nakaseke Multipurpose Community Telecentre in Uganda" in Colin Latchem & David Walker (eds) Telecentres: Case studies and key issues (107-117). Vancouver: The Commonwealth of Learning. M'Bayo, R.(1997). "Africa and the Global Information Infrastructure," Gazette: The International Journal for Communication Studies , 59 (4-5): 345-364. Melkote, S. R. & Steeves, H.L. (2001). Communication for Development in the Third World: Theory and Practice for Empowerment. New Delhi: Sage. Mutiibwa, P. (1992). Uganda since Independence: A Story of Unfulfilled Promises . Kampala: Fountain Publishers. Nulens, G. and Audenhove L. (1999). " An Information Society in Africa?" Gazette: The International Journal for Communication Studies , 61 (6): 451-471. Oestmann, S. & Dymond, A.C. (2001). "Telecentres: Experiences, Lessons and Trends" in Colin Latchem & David Walker (eds) Telecentres: Case studies and key issues (1-15). Vancouver: The Commonwealth of Learning. Oyelaran-Oyeyinka, B. & Adeya, C.N. (2004). "Internet access in Africa: empirical evidence from Kenya and Nigeria." Telematics and Informatics 21: 67-81. Panos. (1998). "The Internet and Poverty: Real Help or Real Hype?" Briefing No.28 . London: Panos. Patterson, R. & Wilson, E.J. (2000). "New IT and Social Inequality: Resetting the Research and Policy Agenda." Information Society 16 (1): 77-86. Polikanov, D. & Abramova, I. (2003). "Africa and ICT: A Chance for Breakthrough?" Information, Communication & Society 6 (1): 42-56. Punch Newspaper (2004). Picture (a micro-telecentre in Lagos, Nigeria). Punch Newspaper (online edition), March 27, 2004. Richardson, D. (1998). "The Internet and Rural Development." In D. Richardson and L. Paisley (Eds.). The First Mile of Connectivity . (170-181). Rome: FAO. Robins, M. (2002). "Are African women online just ICT consumers?" Gazette: The International Journal for Communication Studies , 64 (3): 235-49. Sonaike, S. A. (2004). "The Internet and the dilemma of Africa's development" Gazette , 66(1): 41-61. Shade, L. (2003). "Here Comes the Dot Force! The New Cavalry for Equity?" Gazette: The International Journal for Communication Studies , 65(2): 105-118. UNDP. (2001). Human Development Report 2001: Making New Technologies Work for Human Development. New York: Oxford University Press. Uganda Bureau of Statistics (2001). Uganda National Household Survey 1999/2000: Report on the Community Survey . Kampala: Uganda Bureau of Statistics. Warschauer, M. (2002). "Reconceptualizing the Digital Divide" First Monday , 7(7). Available at: http://firstmonday.org/issues/issue7_7/warschauer/index.html (Last accessed July 26, 2004). World Bank. (1997). "Telecommunication". Washington DC: World Bank. 1There is a big question on the continued viability of the African ONE project. In 2002, the American multinational company, Global Crossing, which is one of the leading partners in the project, filed for bankruptcy as a result of an accounting scandal. See this BBC report for more details: http://news.bbc.co.uk/1/hi/business/1870129.stm . Lucent Technologies, which is also involved in the project, is currently on the verge of bankruptcy as a result of a market slump in the telecommunications industry since 2001. 2Given that globalization means different things to different people, I am using globalization in the way that Joseph Stiglitz used it in his book, Globalization and its Discontents . Stiglitz defines globalization as "the closer integration of the countries and peoples of the world which has been brought about by the enormous reduction of costs of transportation and communication, and the breaking down of artificial barriers to the flows of goods, services, capital, knowledge, and (to a lesser extent) people across borders"(2003:9). As he clearly explained in his book, globalization is driven by international corporations. The international institutions such as the IMF, the World Bank and the WTO oversee ("govern" in Stiglitz's word) globalization. 3Fourteen countries are involved in the second phase of the Acacia, which will run from 2001- 2005. These countries are: Tanzania, Kenya, Uganda, Rwanda Benin, Ghana, Senegal Angola, Namibia, Mozambique, Egypt, Tunisia, Morocco and South Africa. 4When radio sets and television sets were initially introduced, it was not uncommon to find a whole hamlet sharing one radio set or television set. Often, people gathered at one location and watched the television programs together. 5Empowering here refers to social transformation and economic growth. 6The report considered social activities as consisting of sending and receiving e-mail, making and receiving phone calls, sending and receiving of faxes, and chatting online.